A powerful way of thinking about events emerges from answering this question. Looking through this lens leads me to the Venn diagram above, which I think is an interesting way to view different kinds of meetings. You may quibble about the definitions and boundaries of the event types plotted—feel free to share your thoughts in the comments! It’s surprising how nicely most common event types fall into one of the seven combinations of the three constituencies. 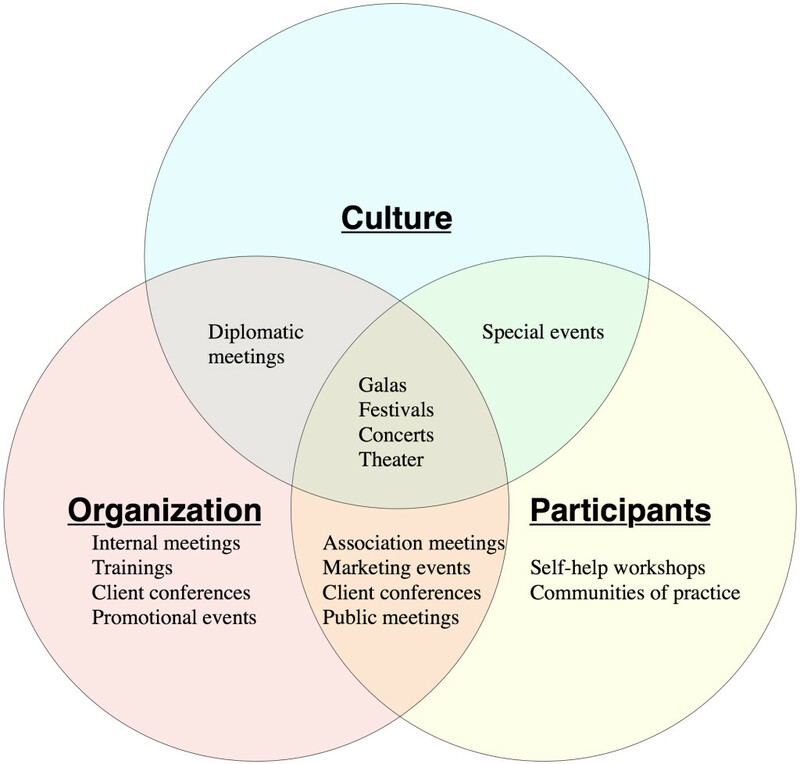 One exception is what I call “client conferences” which can be predominantly for an organization’s benefit (e.g. “in order to qualify to sell our products you must attend this conference”) or for both the organization’s and clients’ benefit (e.g. “learn how to sell our products better and let’s all make more money”). In my work, I sometimes see tension between the needs of the organization and those of the participants. Part of my approach to event design is to make events win-win for both. Feel free to add religious events wherever you think appropriate. I’m not going there. I see this formulation as a work in progress, so your comments, additions, and corrections are especially welcome! This entry was posted on Monday, September 1st, 2014 at 7:30 am	and is filed under Event design. You can follow any responses to this entry through the RSS 2.0 feed.You can leave a response, or trackback from your own site.